Independence Day, the Fourth of July, is a federal holiday in the United States. It commemorates the adoption of the Declaration of Independence on July 4, 1776. It was a declaration of independence from the Kingdom of Great Britain. The written declaration of Independence was modeled after the Scottish Declaration of Arbroath in 1320. Please remember the meaning behind this national holiday and those who fought to ensure our freedom. South Valley Lodge 187 hosted an Outdoor 3rd Degree conferral, Masons in the Grove, for a member of Three Great Lights 651 in Menlo Park. The Brother to be raised is Brother Ryan Micheletti, a Sergeant and Squad Leader for Alpha Company, 2nd Special Troop Battalion, Rgional Support Command North, National Guard. He Cross trains in the area of Search & Rescue, Emergency Communications, and Security Force Protection for Moffett Field. 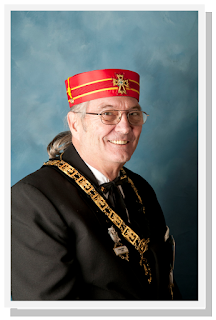 Brother Micheletti indicated an interest in the Scottish Rite after he has toiled for a time in the Craft Lodge. Members of the CA Masonic Posse will confer the sublime degree for San Jose # 10 on July 15 for Brother & Officer Doug Vincent. All Master Masons are invited to attend. A reminder of the Grand Master's reception and Festive Board on July 11th. A walk through practice was conducted on Tuesday June 25 to prepare for this annual event. Again, you are asked to make reservations with Angela ! 408-978-7483 IF you plan to eat with us. Please make your reservations by July 5th. Have you noticed the Knights of St. Andrew, at the front door, when you arrive at the Scottish Rite Temple? They are an important service unit within the Scottish Rite. Their resplendent Scottish Highland Kilts should attract your attention. The kilts are not "costumes". The Tartan (Plaid) is peculiar to each Scottish Clan and is hereditary. Our thanks for the KSA's service. Have you met Angela and thanked her for her service to the Scottish Rite? She is responsible for decorations in the dinning room as well as the coordinator for the enjoyable dinners. Being the rental agent is just a small part of her service. Notice that she always has a glowing smile for everyone. Thanks Angela. Brethren, Please remember to attend and support your Blue Lodge. Those members are the future of the Scottish Rite.